It's that wonderful time of year when the cicadas trill in high pitched notes in the gumtrees, and hot, sunny days are broken by the distant rumble of the approaching storm clouds. Claps of thunder boom across the sky, as white strobe-like flashes of lightning light up the dark clouds. We can smell the rain before it arrives. Fresh, sweet and cool. Each afternoon, heavy drops begin to fall before sunset, making 'ting-ting-tang' sounds on the corrugated tin balcony cover. 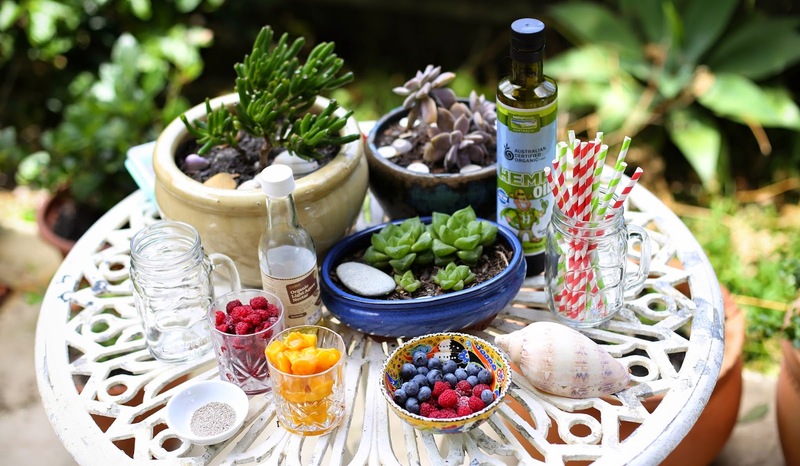 The late showers nourish the earth, turn the rapidly growing grass a vivid green and water the various vegetables and herbs we have scattered about our steps and front garden in odd shaped terracotta pots. The passionfruit flowers begin to bloom as their long, curly vines reach out to claim the fence. Long December days at our seaside home are always hot, sun drenched and occasionally humid before the storms arrive. The storms themselves are frequent, occasionally interrupting the power but usually they make the lights blink and the little dog pant. Growing up by the sea during the summer was a magical time. We had six weeks of school holidays packed with long beach days, surfing at our local 'secret spot', scuba diving from the beach or boat, snorkelling at the entrance to the lake, enjoying summer barbecues, and fresh, sweet fruit. Rainy afternoons were spent crafting away bringing two dimensional pictures to life with paper tole, making Christmas decorations, listening to carols, eating dripping watermelon, sucking on mango cheeks and drinking smoothies. 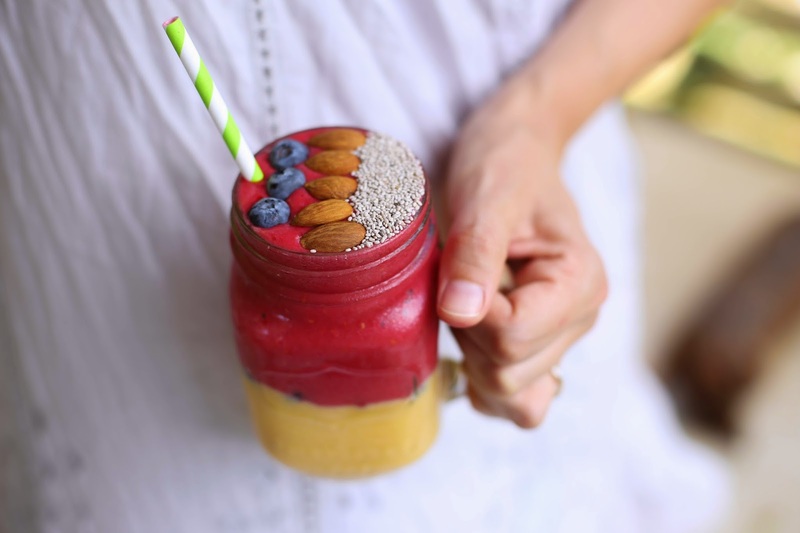 Here's a little festive smoothie to brighten your Christmas morning. 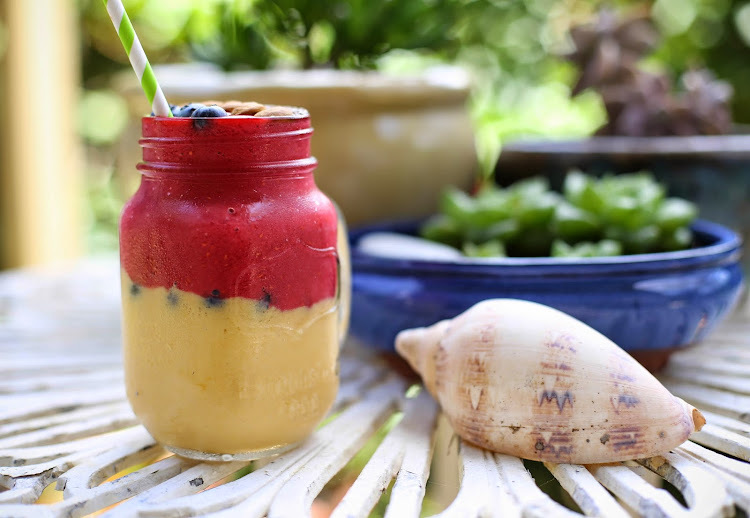 It's healthy, organic, vegan and filled with all the sweetness of summer fruits. Blend until smooth, pour into a large glass or jar. Blend until thick and smooth. 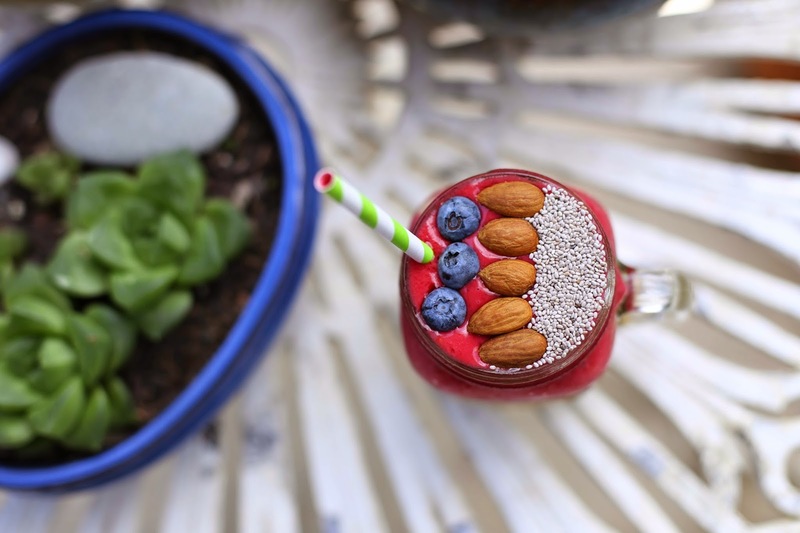 The frozen berries turn into a dark, rich magenta drink, the icy consistency of a thick slushie. The flavour is quite tart, and slightly nutty due to the addition of almond milk. Spoon a small amount of the raspberry smoothie over the mango smoothie, just enough to cover the yellow fruit layer, then pour in the rest. 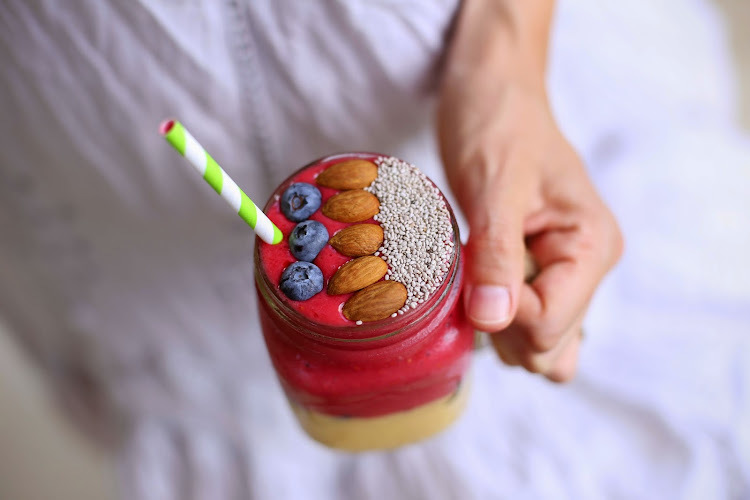 Decorate with raw almonds, chia seeds and fresh blueberries. Enjoy with friends and family after a long day at the beach. 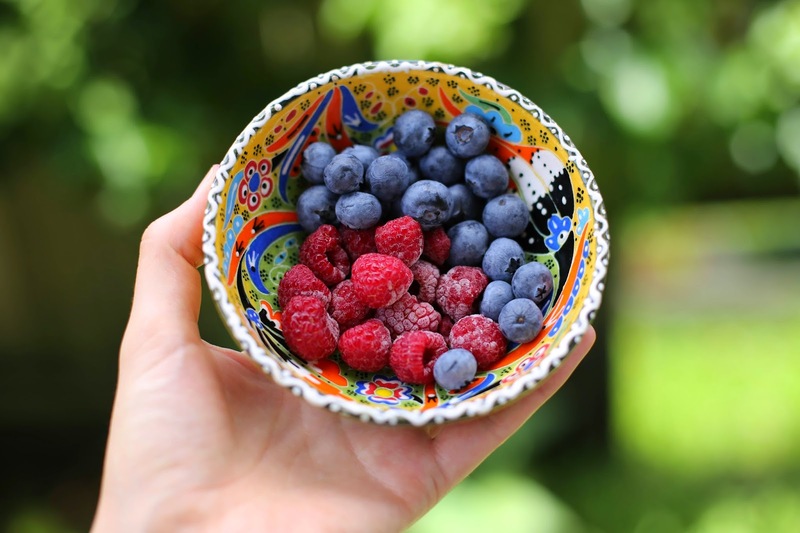 Blueberries and raspberries: contain vitamin C and phytonutrients, which support our body systems. Bananas: contain high amounts of potassium and low amounts of sodium, making this fruit excellent for heart health. Merry Christmas dear friends! May your day be filled with joy, laughter, music and the company of your loved ones. This is wonderful. I'm gonna try it. My New Years res was to eat more healthy foods. But I've gotta say, I just can't get over your dress! I want it!